Under the spotlight today is Keto Base Exogenous Ketone Supplement by a manufacturer called Vivorigins. If you subscribe to the ketogenic diet, this may be for you. The manufacturer frames the working of this supplement as being intended to improve the impact of any existing keto diet you may be following. It is intended to increase your energy levels and vitality, your performance in the gym or when you exercise, and your rate of fat burn. Betahydroxybutyrate or BHB releases ketones into the bloodstream that regulates insulin levels. As a result, your sugar spikes and valleys and food cravings in general should decrease. L-Citrulline is converted into another amino acid called L-arginine and well as nitric oxide. Together, these enhance blood and vascular health, which aid physical endeavors such as exercise. Calcium, on the other hand, mostly benefits the bones while magnesium gives you more energy, calms nerves and anxiety, helps you sleep better and also helps with digestion. Importantly, it can also help your recovery period after a big work out, helping sore muscles heal quicker. This is a powder-form supplement. Dissolve one scoop of powder in 12 to 16 ounces of water, juice or milk, or use it as directed by your doctor. Do not exceed 4 servings (each serving being one scoop of 14g) per day. Keto Base Exogenous Ketone Supplement contains no wheat, egg, dairy, soy, fish or shellfish, so is safe to consume if you are allergic to any of these. It is best to clear using this supplement with your healthcare provider, particularly if you have specific nutritional needs or conditions related to diet, or are on chronic medication. You should also consult your doctor if you are pregnant, breastfeeding or trying to conceive. In the beginning you may experience lower blood pressure, frequent urination, sweating and flu-like symptoms, muscle spasms and heart palpitations as the body adjusts. This is not explicitly stated but it is a fairly common occurrence when switching to a ketogenic diet. Up your fat intake slightly if this happens and also drink more water. One container of 64 ounces sells for $43.99 on the product website and on Amazon. This appears to be the only size container available. No discounts for bulk sales were indicated. Your first recourse, says the manufacturer, is to approach Amazon where the product is mostly sold. If you cannot come right, you should contact them with your order number within 30 days to receive a refund. On a ketogenic diet, your body uses ketones as fuel, rather than carbohydrates. Ketones are derived when fatty acids are metabolized and this of course is why in ketosis, ideally you lose body fat and weight. If the body has to convert carbohydrates into fuel, there is always the risk that some of it could be stored as sugar. Exogenous ketones are ketones sourced outside of the body. BHB is one of the three main ketones in your body and by consuming it, you could simulate some to much of ketosis, without actually being on a ketogenic nutritional plan. The major advantage of BHB is that besides burning fat reserves, it also controls appetite, as you should no longer crave specifically empty calories such as sugary- and salt-laden snacks. In addition, the formula is also meant to help you with your efforts to exercise by increasing your endurance and recovery. The product though is incredibly expensive, even though it may last longer than one month. It is almost triple the price of some other supplements offering more or less the same ingredients, even if in different form. If you’re a fan of all-natural products, this supplement isn’t for you. The result is usually more side effects, not fewer. What you are doing is introducing synthetic ketones into the body. If this bothers you, switch to a product containing natural exogenous ketones. 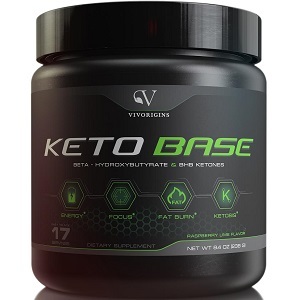 John Parker	reviewed Vivorigins Keto Base Exogenous Ketone	on April 11th	 and gave it a rating of 3.